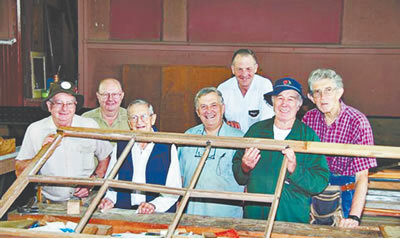 Enjoying their work: Members of the Retirees' Group pose with a sash under repair. Col Burne, Neil Cram, Ron Russell, Jeff Russell, Dave Grove, Bob Matthew and Dave Torr. The Valley Heights Locomotive Depot Heritage Museum has scored a much needed makeover after receiving a grant from the NSW Heritage Office to repair the windows at the rear of the Roundhouse. The depot, completed in 1913, was built to service steam locomotives which provided extra power to enable the trains to ascend the steep rise from Valley Heights to Katoomba. The depot was closed in 1989 and vacated by the then State Rail Authority (SRA) in 1993. The museum now looks after the site. Most of the glass panes were broken before the window sashes were removed in the mid 90s because of termite damage to the surrounding jambs and sills. The grant ($20,600) has enabled the museum to purchase the glass panes, timber and associated incidentals. The museum, in turn, has to provide $87,900 in labour. The 95-year-old sashes require many hours of patient repair work and cleaning before the panes are fitted and the sashes installed. This volunteer work is being carried out by the Museum’s Retirees’ Group — these fellows meet for one week every month (the week after the second Saturday), starting at 8am and finishing at 3pm. This group is a big ‘Men’s Shed’ where the members perform a valuable community service in a good humoured atmosphere. Members work on tasks that suit their abilities and some come for the full week while others are able to be there for a day or two. The museum is always looking for extra volunteers to help in the varied tasks (ground maintenance, track work, machinery operation, shop assistants). Please feel very welcome to drop in during the Retirees’ week and they will show you around the museum. Page Updated: Wednesday, 07-Nov-2018 13:34:13 PST.